Novak Djokovic is a Serbian professional tennis player born on May 22, 1987. Currently, he is ranked number one in men’s singles tennis by the Association of Tennis Professionals (ATP). Novak received his training from the former Slovak tennis player Marian Vajda and six-time Grand Slam Champion Boris Becker. He began his professional career in 2003 and at that time he mainly played in Futures and Challenger tournaments. A year later, Djokovic became one of the 40 best players in the world singles rankings also won his first ATP title at the Dutch Open in Amersfoort. Upcoming years brought more success and fame to him and he won several titles including Grand Slam Singles titles, Australian Open titles and ATP World Tour Finals. Furthermore, Novak is the first Serbian player to be ranked no. 1 by the ATP and also won numerous accolades such as Laureus World Sports Award and BBC Overseas Sports Personality of the Year. Philanthropically, he has established the Novak Djokovic Foundation in 2007 with a purpose to help children from disadvantaged communities to grow up in safe environment. As for his personal life, Novak Djokovic became married to Jelena Ristic in 2014. The complete tennis star Novak Djokovic body measurements are listed below including details of his height, weight, chest, waist, biceps and shoe size. Novak favorite color is Red. He is an avid fan of Red Star Belgrade. The Hunger Games is his favorite book. Djokovic held a racquet for the first time, at the age of four. 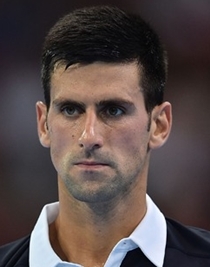 Novak can speak several languages including Serbian, French, English and German.